Y’all know I’m out on the street a fair bit in WR. Always looking for signs on the trail. Look up. Look down. Where did that come from? Why is it here? Surrendering to a mashup of confirmation bias and humanly-flawed pattern recognition, I am finding abandoned shoes… everywhere. Not the more obvious strain of hanging-by-the-laces-from-power-lines, but rather the ground variety. It all makes me wonder what set of circumstances led to these shoes being alone in a public place with no obvious owner. It could be good stuff: having the time of my life and kicking off my shoes! It could be dire: totally not doing ok and not having shoes on is the least of the problems. Having never seen the de-shoeing actually in progress, it’s hard to say. From Victoria and Oak, this is Kitchener. This entry was posted in photography and tagged 1shot, Kitchener, shoes, street. Bookmark the permalink. 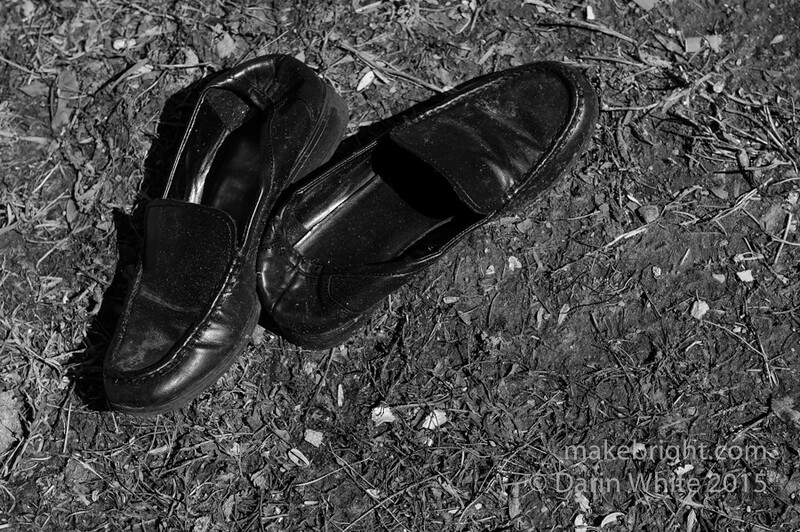 1 Response to 1shot #225-abandon shoes!